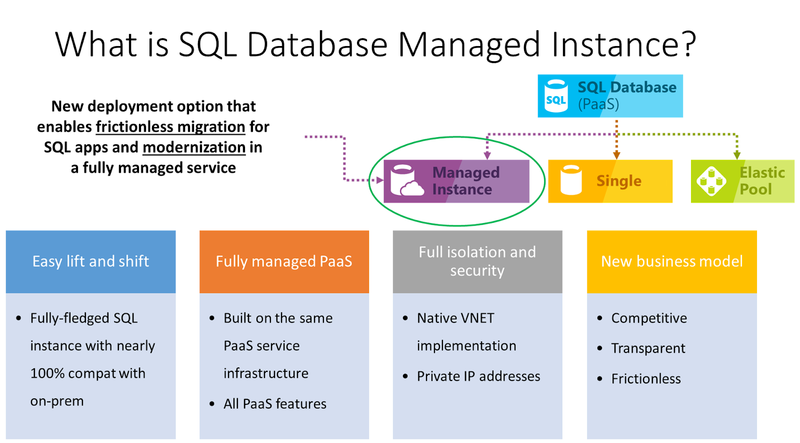 At Microsoft Ignite it was announced that Azure SQL Database Managed Instance will be general availability on October 1, 2018. Azure SQL Database Managed Instance is a deployment model of Azure SQL Database. This service enables customers to migrate existing databases to a fully managed PaaS cloud environment. It is possible to use the Data Migration Service (DMS) in Azure to lift and shift their on-premises SQL Server. This can be a useful tool to use for secure databases that reduces the management overhead. including automatic patching and version updates, automated backups and high-availability.